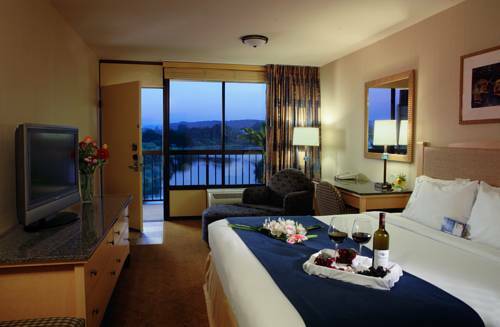 Seaside Hotel's Alluring Coastal Location Delights VisitorsYou can view award-winning exhibits at the Monterey Bay Aquarium, catch the waves at breathtaking Del Monte Beach and much more while lodging at the Holiday Inn Express At Monterey Bay hotel in Seaside. Off Hwy 1, the hotel's location near Monterey Peninsula Airport, two blocks from the beach and 2.5 miles from downtown Monterey, is ideal.Incredible attractions abound in the Seaside, CA area, and the hotel's leisure guests enjoy easy access to them all. Carmel-by-the-Sea is seven miles away. You can test your swing at Pebble Beach Golf Links, America's greatest public golf course, before exploring famed Cannery Row or indulging in fresh seafood at Old Fisherman's Wharf. For high-speed thrills, check out the races at Mazda Raceway Laguna Seca.If you're visiting for work in Seaside, CA, the hotel's free Wi-Fi access and a 24-hour Business Center help you keep in touch with the office. Also, the hotel's location near Monterey Peninsula Airport means flying into Seaside is an easy option. The Naval Postgraduate School and the Defense Language Institute Foreign Language Center are both within four miles of the hotel.During your visit, you can begin every fun-filled day at the free, hot breakfast bar. After a day of work or sightseeing, unwind in the heated, outdoor pool and whirlpool or work out in the well-equipped Fitness Center. For a wonderful Seaside stay, please book now. Childrens's program - Monterey Bay Aquarium is located 3 1/2 miles from the hotel and is a 'must see' for people of all ages. The Aquarium is a great place to visit and catch a bite any day, but especially a foggy one! Pebble Beach Golf LinksThe famed Pebble Beach Golf Links is just a short drive away. Located in the majestic Del Monte Forest, known as Pebble Beach, which also hosts Spanish Bay and Poppy Hills GC. The most photagraphed golf hole is number 7 at Pebble Beach Golf Links.